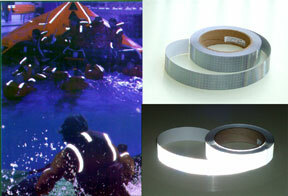 We carry 4 basic types of Pre Approved Prismatic Conspicuity Tapes. Our prismatic tapes are manufactured by Reflexite and are comparable to diamond or crystal grade tapes in brightess. 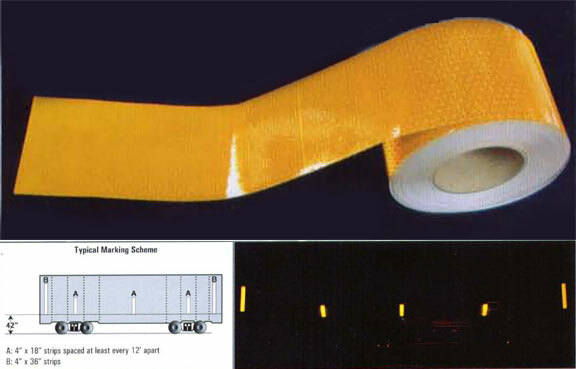 DOT-C2 Conspicuity Tape for Trucks, SOLAS Coast Guard Approved Tape for Marine Applications, DOT approved School Bus Tape and FRA Approved Rail Car / Railroad Train Tape. Tractor Trailer DOT-C2 Prismatic Grade Reflective Conspicuity Tape Rolls. Prismatic Reflective. Very Bright. High Angle of Visibility. Strong Adhesive. Up to approximately 800 Candlepower. (white) Available in the popular 7" white/11" red pattern and a 6" white/6" red pattern.